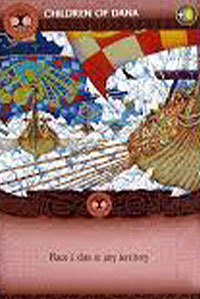 Eriu: The Tuatha Dé Danann made the promise to the Milesians, who had recently arrived in Ireland, to name the island after Eriu in exchange for her help. 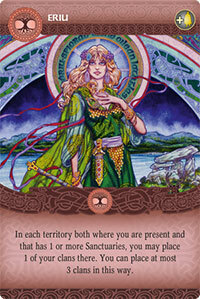 She is the goddess that personifies Ireland. Battle Frenzy: Some warriors, like Cúchulain, may experience warp spasms which completely distorted their bodies and gave them a frenzied fighting spirit. 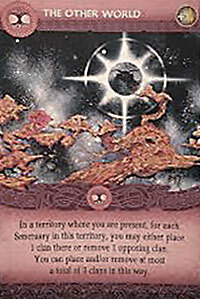 Kernunos' Sanctuary: Kernunos is the personification of savage people, nature, life, forests and fertility. He is a mysterious god apart from the other gods. The Otherworld: Tír na nÓg is the land of gods, dead people and endless joy; it is the realm of eternal youth where gods took refuge. Some mortals have sometimes been able to access it… +Balor's Eye: Balor, king of the Fomorians and demon of the Northern Islands, had an evil eye in his forehead that he could use to smite his enemies. 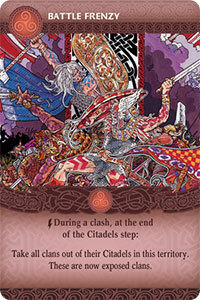 The Battle of Moytura: The second battle of Moytura opposed the Tuatha Dé Danann and the Fomorians and was devastating. 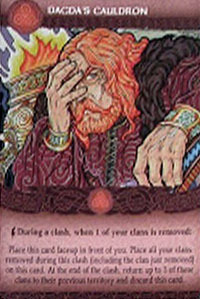 During the battle, Lugh killed his grandfather Balor and the Fomorians left Ireland in the aftermath. Deirdre's Beauty: Deirdre was loved by King Conchobar mac Nessa and her beauty was the cause of many tragedies and massacres before she killed herself. 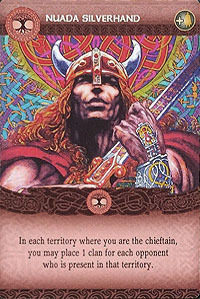 Tale of Cùchulain: Cúchulain, one of the greatest Celtic heroes, is the son of the god Lug. He defended Ulster single-handedly against Queen Maeve's champions. He also rejected the advances of the Morrígan. Dagda's Club: Thanks to this weapon, the Dagda has the gift to kill but also to restore life. Dagda's Harp: This divine harp plays all songs, in particular the songs of sadness, laughter and sleep. The Dagda plays this harp to give rhythm to nature and the four seasons. Lug's Spear: The spear of the god Lug ensures victory to its possessor. Dagda's Cauldron: This cauldron of abundance can feed all the tribes without ever lacking. It can also bring the dead back to life. Tuan's Memory: Tuan is a druid and hermit who survived several centuries by transforming himself into different animals. He was in Ireland before the arrival of the Tuatha Dé Danann and the Fomorians. He witnessed the five conquests and conversed with St. Patrick. 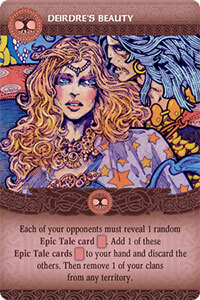 He is History's memory +The Morrigan: She is the goddess of war and sovereignty and the Dagda's wife. She sometimes appears in the form of a raven. 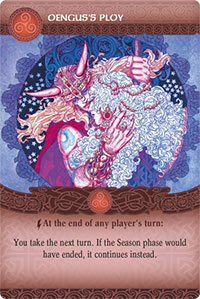 Cathbad's Word: Cathbad is a druid, prophet and warrior. He was the father of King Conchobar mac Nessa and the tutor of Cúchulain. The Champion's Share: The best part of a banquet. It is reserved for the most prestigious warrior and could be lead to many arguments. The Stone of Fal: Brought to Ireland by the Tuatha Dé Danann, the stone was said to roar when it came into contact with a man worthy to rule. Tailtu's Land: Daughter of a Fir Bolg king, Tailtu opened up the forest to make the ground ready for cultivation before dying of exhaustion. Her adoptive son, Lug, established the harvest festival, Lughnasadh, in her honor. 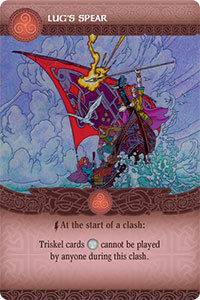 Breas' Tyranny: Breas "the Beautiful" became king of the Tuatha Dé Danann when Nuada abdicated. But he was a very mean and greedy king who did not share his wealth and despised the bards. He also abdicated after a poet produced a terrible satire of him. Afterwards, he led the Fomorians to war against the Tuatha Dé Danann, a war which will end after the second battle of Moytura. 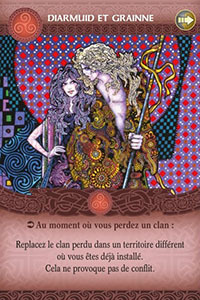 Ogma's Eloquence: Ogma, a member of the Tuatha Dé Danann, is the master of eloquence and knowledge. Also a poet and a warrior, he invented the Ogham, the sacred alphabet. 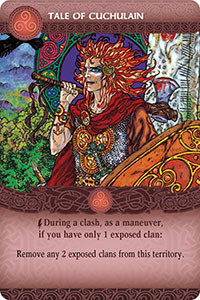 Streng's Resolve: As a Fir Bolg champion, he cut Nuada's hand during the first battle of Moytura. Even on the edge of defeat, he and three hundred surviving warriors fought with such a strong will that the Tuatha Dé Danann, out of respect, offered him the Connacht, a region in the north-west of Ireland. 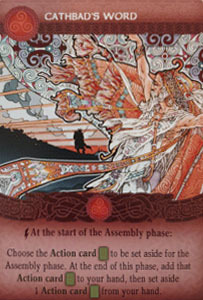 The Dagda : The Dagda, the kind god, is the potector of tribes. He is a druid, a warrior, a sage, the harbinger of life and death, and the master of time and seasons. 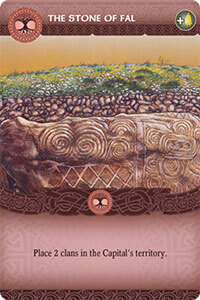 Children of Dana: The Tuatha Dé Danann came from the northern islands and settled in Ireland. They fought against the Fir Bolg and then against the Fomorians. Later, they withdrew to the Otherworld, making way for Men, the Milesians. The Fianna: They are a band of mythical warriors. 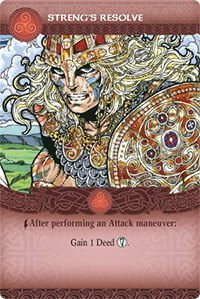 Their leader, Fionn mac Cumhaill, is one of the great Celtic heroes, warrior, poet and unexcelled magician. 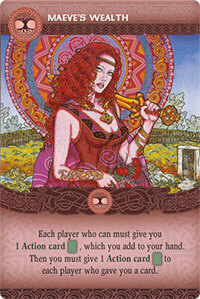 Maeve's Wealth: Maeve, as Queen of Connacht, shares her wealth with her people. She goes to war against the king of Ulster, Conchobar mac Nessa, to capture the Brown Bull of Cooley. 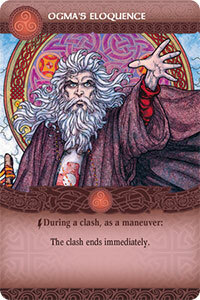 Lug Samildanach : Lug is a member of the Tuatha Dé Danann related to the Fomorians through his grandfather Balor. He is the master of all arts and sciences. 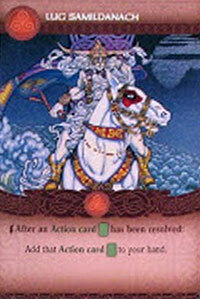 Thanks to this, Nuada offered him to lead the Tuatha Dé Danann during the Second Battle of Moytura. 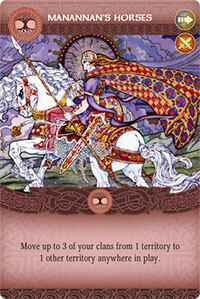 Nuada Silverhand: King of the Tuatha Dé Danann, he had to abdicate when he lost his arm against Streng. He regained the right to reign when Dian Cecht made for him a silver prosthetic arm. He was killed by Balor during the second battle of Moytura.